Literature Guide. 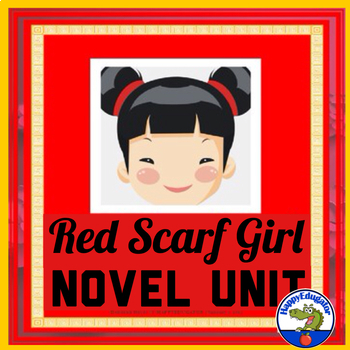 Red Scarf Girl by Ji Li Jiang Novel Study. 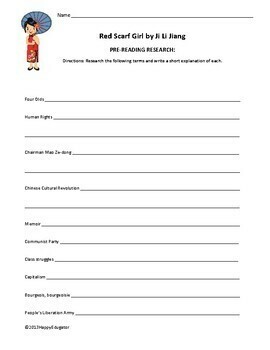 Nonfiction - Chairman Mao and the Cultural Revolution impact the life of a young girl and her family. 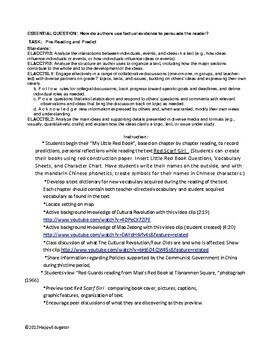 Literature Guide includes Pre-reading activities, Vocabulary, Vocabulary Tests with answer keys, Study guide, Discussion questions, Unit plans aligned with standards, writing focus, grammar practice, Supplemental materials and visuals for class discussion, Jigsaw reading activities, projects, and directions for teaching, including links to audio and video resources. 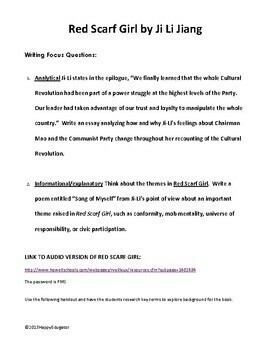 Final project and rubric. 112 pages.